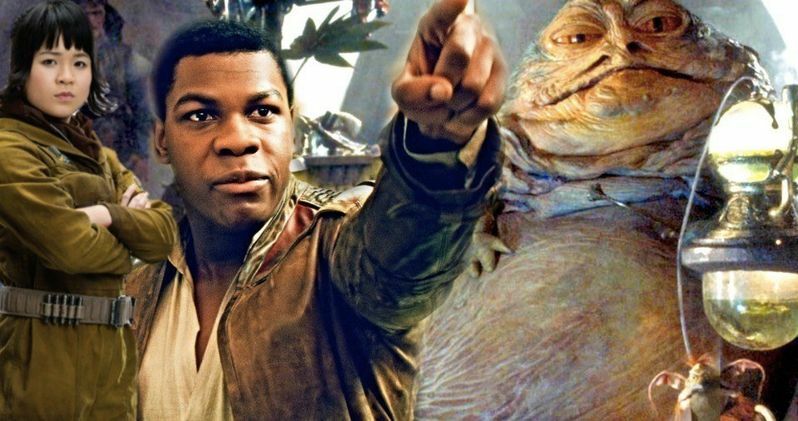 Finn and Rose Scene in Star Wars 9 Pays Tribute to Return of the Jedi? Is Jabba the Hutt returning in Star Wars 9? Of course not, he's dead. Leia (dressed in what has become a very controversial space bikini these past couple of years) choked him out on a sail barge, ending the gangster's galactic tyranny. But that doesn't mean we won't get an important connection to the king of slug life. Apparently, his son will play a key role in J.J. Abram's saga ending sequel, paying homage to Return of the Jedi. We've met Rotta the Hutt before. He was most infamously introduced in the Star Wars: The Clone Wars movie. And fans didn't just hate this baby Hutt, they loathed him. You hear about disliked Star Wars characters, but Rotta, who looks like booger sperm, gives Jar Jar Binks, Holdo and Rose Tico a real run for galactic credits. Jabba nicknamed this crusty tadpole 'Pedunkee Mufkin', which cringingly translates into Punky Muffin. We can only hope Rose Tico calls him that in this upcoming movie. When last we saw Punky, he was knee-high to a Kowakian monkey-lizard. Now, in Star Wars 9, he'll be all grown up and running his father's business. Where was he in Return of the Jedi? Who knows. That question will probably be answered in one of the many books that will be dumped into stores in the lead up to Episode 9. He would have presumably been an adult by then, so he could have been anywhere in the galaxy, having his own adventures. Director J.J. Abrams apparently wants to tie all three trilogies, the prequel, original and Force Awakens, together in a nice shoestring bow. And that includes this homage to Return of the Jedi. Though we're not sure what the story is behind their meeting, Finn and Rose will be traveling to visit Rotta, whom we've heard before is actually helping the Resistance in their fight against the First Order. The scene Rotta shares with Finn and Rose will be very reminiscent of those opening moments in Episode VI. We've previously heard that Rey, Poe and Finn spend most of Star Wars 9 together. That's still very much the case. But the gang will be separated for a short time. While Finn and Rose are visiting Rotta, Rey will be in the sky above them, flying with Maz Kanata on her super-Sail Barge. This giant pirate ship is very similar to Jabba's Tatooine sail-barge, though it has gigantic metallic wings and is soaring just outside of the atmosphere. Rey and Maz will be joined by Chewbacca and Lando. Leaked art suggests that ol' robot lover Pando Lando will be sitting in a glass dome, possibly waiting to fire on an attacking enemy. This leads back into the rumor that we won't see the former general walking much in the movie, with Abrams keeping him seated for a duration of the runtime. This is due to Billy Dee William's health problems and the fact that he walks with a cane in real life. It isn't know if Finn and Rose's meeting with Rotta takes place on Luke's old home planet. It's very possible. J.J. Abrams plans to visit several planets from the past trilogies. So far we've heard that he's heading back to Darth Vader's castle on Mustafar, Rey's home planet of Jakku, the Jedi holy planet of Jedha, and we now have leaked intel that the production, which has been ongoing for almost two weeks now, is gearing up for a shoot in Italy, where Abrams and his crew will resurrect Naboo. What will be happening on Naboo? That info isn't out there yet, but it's suspected that Leia will be heading there, and she could possibly be buried there alongside her mother Padme. Though, there is also strong speculation that J.J. won't dare kill the character off, initiating his Plan 9 to use old footage of Carrie Fisher, keeping her character alive long enough to get her to the end of this final chapter in the Skywalker saga. Star Wars 9 won't just pay homage to Return of the Jedi with its reintroduction of Rotta the Hutt. There are a ton of callbacks planned that will encompass every aspect of this galaxy far, far away. These latest rumors were dropped by Drunk Chicken TV. The inclusion of Rotta sounds like a real Rian Johnson idea, and maybe it was. We can only hope that when Finn and Rose visit the giant space slug in his den of scum and villainy, Rose is taken to a dungeon and tickle-tortured by a googly-eyed, rainbow colored robot frog monster called Etinpi Skyvor. Cause that's the scene we really want to see.